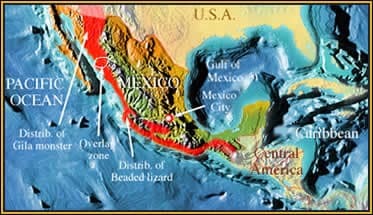 Location: The Gila monster occurs from Utah to n.Sinaloa, the Beaded lizard occurs from Guatemala to s.Sonora. The two species overlap in southern Sonora. 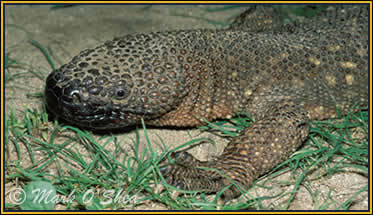 There are only two species of venomous lizard in the world, the Gila monster and the Beaded lizard. The former exists as two subspecies in southwestern USA and northwestern Mexico south to northern Sinaloa State, the latter occurs as four subspecies from Guatemala, north through western Mexico to southern Sonora State. There is a small overlap zone in southern Sonora where both species occur and Mark plans to try to find both species as close together as possible. This task is made more difficult by the fact that Gila monsters are basically desert fringe lizards while beaded lizards inhabit deciduous woodlands, different habitats in other words. They also spend a large proportion of their lives underground so the chances of finding them out and about are slim. Brent Martin has considerable experience with Sonoran reptiles so his assistance will be essential if Mark is to succeed. In Sonora Mark discovers one of the richest herpetofaunas of his life. A close view of a Rio Fuerte beaded lizard (Heloderma horridum exasperatum), note longer head and more subdued patterning.